When Sprint announced their first ever 4G handset at CTIA in March 2010, they dropped a bombshell on the mobile world. 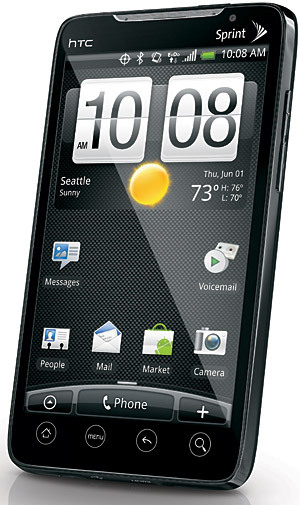 The HTC Evo 4G is a device that introduces a lot of firsts when compared to other North American handsets. This is the first Android phone we've seen with aforementioned 4G capabilities which should please a lot of fans looking to get more out of their mobile data. To say the HTC Evo 4G LTE is a looker is, well, a serious understatement. Clad in black anodized aluminum, glossy premium plastic, flashy red accents, and ringed by a sophisticated silver trim, this phone is drop-dead gorgeous. You can tell HTC put a lot of thought into the Evo's design, right down to its retro transistor radio-style buttons. Measuring 5.31 inches tall by 2.72 inches wide, there's no denying that this new Evo is a handful. At just 0.35 of an inch thick, though, the phone is a hair thinner than the One X. That's trim enough to make you forget its sizable footprint. Additionally, somehow the Evo 4G LTE manages to weigh a light 4.73 ounces despite its laundry list of powerful internal hardware. Sporting a gigantic 4.7-inch Super LCD 2 (1280x720 pixel) display, the front of the HTC Evo 4G is almost all screen. Similar to my experience with the HTC One X, the Evo’s screen gets very bright and creates vivid colors. Viewing angles are wide, too, both horizontally and vertically, which is traditionally a weakness of LCD technology. Of course, I personally prefer AMOLED displays for their higher contrast, deep blacks, and truly eye-popping colors. For instance, the qHD AMOLED screen on the HTC One S, though not as sharp, painted richer hues. Above the Evo's large display is a 1.3-megapixel front-facing camera for snapping vanity shots or video chatting. Also, just like the HTC One X, there are three capacitive buttons for back, home, and recent applications below the screen. A stylishly silver oval-shaped power button and standard 3.5mm headphone jack are on the handset's top edge. The right-side houses a thin black volume bar that I found difficult to press or even locate, as it blends in against the phone's black background. Here too is the phone's dedicated camera button crafted in silver and an etched ring pattern surface. Unfortunately I couldn't get the button to wake up the phone and launch the camera from standby. Placed on the phone's back is its main 8-megapixel camera with LED flash. It sits on the top portion which is crafted from high-gloss plastic and covers the Evo's MicroSD card slot. The lower half uses handsome and fingerprint-repellant anodized aluminum. Dividing the two regions is a striking red stripe that conceals a spring-loaded kickstand. It's an awesome feature, one that I feel more big-screened phones should have. I also appreciate how the kickstand functions properly regardless of the phone being placed on its left or right side. The HTC Evo 4G LTE's cutting-edge software is just as compelling as the phone's hi-octane hardware. Besides the latest iteration of Google's Android OS, version 4.0 Ice Cream Sandwich, you also get HTC's freshly revamped Sense user interface. According to HTC, Sense 4 fits the new functions of ICS like a glove, and is designed to run stealthily behind the scenes. Indeed, a lot of what made Sense 3 flashy, but a little too in your face, is gone. I'm talking specifically about the perpetually looping 3D carousel of home screens and fanciful weather graphics that seemed to eat up every morsel of processing power. HTC's classic weather clock plays center stage on the main home screen. Tapping the widget's digital readout launches a world clock with a fancy 3D globe visual; selecting the weather portion of the clock activates a detailed forecast. If you're a weather geek like me, you'll also dig the engaging graphics displayed on the lock screen that correspond to current atmospheric conditions. You can even choose them as your live wallpaper. The bottom edge of each home screen is a tab containing the same four quick-launch icons shown on the lock screen. I really appreciate being able to swap out these icons for others I prefer or even creating and adding folders that hold multiple app icons. You can make a social networking folder for Facebook, Foursquare, and Twitter for example to save screen real estate. Any changes here are reflected on the lock screen; placing application shortcuts on top of one another creates a folder. Sense adds some neat tricks to the browser, such as a Pure Content Reader view that removes all ads and displays just the basic text of a selected Web page. You can also choose pages and video to bookmark for later perusal offline. Another notable piece of software includes the Google Wallet app which uses the Evo 4G LTE's NFC chip to enable mobile payments. Once you sign up for a Google wallet account you can either use the bundled Google pre-paid card or add a Citibank Mastercard if you have one. The app also lists nearby special offers that you can redeem with or without using the app to make the purchase. The Dropbox app for storing files in the cloud comes standard too as does TuneIn Radio for streaming Internet radio stations. In keeping with HTC's One series handsets, the Evo 4G LTE boasts Beats audio processing. It may be a popular solution but I find Beats an acquired taste since it tends to crush mid-range audio frequencies in favor of the high and low end of the spectrum. Beats will, however, automatically detect when the Evo connects to a Beats-branded headset and load its tailor-made equalizer setting. Among the highlights of the Evo 4G LTE's 8-megapixel camera and its features are the dedicated image processor and a Continuous Shooting mode for snapping images in bursts of up to four frames per second. Available on all One series phones, these abilities are all part of what HTC calls its ImageSense technology which actually relies on a specially dedicated processor to improve performance. As part of the deal, you'll also find an HDR mode, widescreen, geotagging, face detection and smile capture, a self-timer, and adjustments for ISO and white balance. The HD camcorder offers a similar set of options plus image stabilization and stereo audio recording. It's also able to record video in full 1080p HD resolution. Photo quality on the Evo 4G LTE was up to the One X's impressive standards. Closeup shots showed good detail and color and outdoor shots were bright without being oversaturated. Shots in bright sunlight were somewhat washed out, but the camera does a decent job with contrast between light and dark areas. This is especially true if the HDR function is used to compensate for strong lighting. Image noise was barely noticeable as well and I was treated to clear pictures provided there was enough light present. Indoor shots were a bit dark without the flash. At heart the HTC Evo 4G LTE is really a modified, Evofied if you will, HTC One X. As such HTC fans in the know understand that like the American version of the One X on AT&T, the Evo runs a dual-core processor not a quad-core CPU like its European cousin. All things being equal though, the Evo 4G LTE's 1.5GHz Snapdragon S4 chip and 1GB of RAM propel the phone along at a very speedy clip. Just for kicks I had the Evo run the Linpack Android test app. The handset spit out a high 102.4 MFLOP (Single Thread) in 0.83 second. The Evo completed the Multi-Thread part of the test in just 0.84 second and notched 201.8 MFLOP. I tested the HTC Evo 4G LTE in New Orleans using Sprint service. On the whole, call quality was admirable. The volume was loud and I found no problems with the audio clarity. Voice pitch on my end was the slightest bit mechanical, but it didn't distract from my experience. Despite the "4G LTE" in its name the handset has a serious mark against it for the time being. Since Sprint's LTE network is not yet operational, and the phone can't surf on WiMax in the meantime, you'll be stuck using the carrier's 3G EV-DO network. A few years ago that would have been fine, but with Verizon and AT&T operating fast and widespread LTE networks, Sprint is falling behind. Sure, it's LTE network may eventually be as powerful as its rivals, but that won't help you right now. Honestly, I don't get the logic of selling a phone with "LTE" in its name when there's no LTE network for it to use. The 3G connection was strong though, even in a hotel room, and speeds were what you'd expect from Sprint's 3G network. Compared with the 4G LTE-equipped One X, though, the difference was clear. Out of eight tests using Ookla's Speedtest.net app, I had an average download speed of 477Kbps and an average upload speed of 422Kbps. AT&T's One X, on the other hand, delivered an average download speed of 16.63Mbps and and average upload speed of 7.53Mbps. Downloading the Speedtest.net app took a painful two minutes over 3G. On Web browsing, the mobile version of the New York Times site took nine seconds to load, while the full New York Times 40 seconds, the full CNET site one minute and 24 seconds, and Airlines.net one minute and 50 seconds. Sprint rates the HTC Evo 4G LTE's 2,000 mAh battery to provide 7.5 hours of talk time. We're still running anecdotal battery tests but will update the review with our results once they're in. With the $199.99 HTC Evo 4G LTE, HTC and Sprint have gone well out of their way to rekindle that old Evo magic. It's a phone that's light years better than its predecessors and flaunts enough features plus a delectable design to strike real fear in the hearts of competitors Samsung and Motorola. That said, this Evo has one rather large Achilles heel at the moment--no 4G LTE. With access to hi-speed data, the Evo will no doubt soar as its brother the HTC One X does on AT&T. Until Sprint's promised LTE network arrives, hopefully by Summer, the Evo 4G LTE is but a fraction of its potential glory.